1) Jon's grandmother, Gram, is in the hospital. She fell and broke several ribs. She is in a lot of pain. They are concerned about pneumonia (she is 91) and it hurts her so much to cough. As of our last phone call, they were not moving her to intensive care, and she had been sitting up in a chair for a while. So that is good news. Please keep her in your thoughts. She is a dear lady full of life and light and laughter. A hippie and an artist; several of her pieces hang in our home. I feel blessed that she came into my life and we both adore her. 3) Several urgent files came in for my "day job" this weekend. Files that need to be done asap. Which means working on Mother's Day. Not that I am a mother or anything…but… And, of course, it isn't my boss that is insisting I work. No. But, our clients need these things turned around and since it isn't sunny enough to take pictures of things I haven't yet finished…I am editing today. Well, and you can't finish things that need to be sewn when you have to spend the afternoon at a café because…. 4) I tried to burn the house down today. Okay, I, of course, did not try to burn the house down, but, I did start a darn nice fire. By accident. Who wants to start a fire in their kitchen? On an electric stove? When the person is just trying to make tea? The story: I filled up the tea kettle and turned on the burner and went back to my little room to edit. And just when I thought, "oh it is probably boiling by now," I started to smell something burning. And thought, "oh there must have been some rice from dinner the other night on the stove or something." And then edited two more sentences before heading to the kitchen. My brain was starting to compute, "hmm…something smells like it is actually on fire" and my eyes started to burn from smoke and I turned the corner to the kitchen/family room. In no particular order of absent-minded horrors: a) I had turned on the wrong burner. b) There was kitchen towel on the stove. c) I had turned on the stove when a kitchen towel was on it. d) The kitchen towel was on the "wrong" burner. e) There were pretty huge, high flames that had engulfed that kitchen towel. f) There was that scary "flames are around" sound as the towel burned. 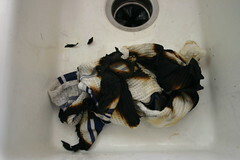 The good parts, in no particular order of importance: There was a section of the towel that was not burning. That section was enough for me to pick up the towel and throw it in the sink, without burning myself (or starting a second fire). We have one of those water hose things in our kitchen sink so I was able to quickly douse the entire towel in water. The flames had not reached the towels that hang from our oven handle. Our smoke alarm went off (remember when it didn't?). Oh and no one was hurt and our house did not burn down. So do you want to do something fun? Like maybe a kitchen/tea towel swap to invite some joy in? did you wear your apron today?